PHILADELPHIA: For the first hours of the Democratic National Convention on Monday, the mere mention of Hillary Clinton’s name was met with a roar of boos from Bernie Sanders’ delegates throughout Wells Fargo Center. On Tuesday, pro-Sanders protestors gathered across from Philadelphia’s City Hall for the “Million Berner March” rally. The demonstrators all had one simple message: Never Hillary. While most of those participating in the Million Berner March completely reject the prospect of voting for Clinton, not all of the Sanders supporters were sold on Stein. 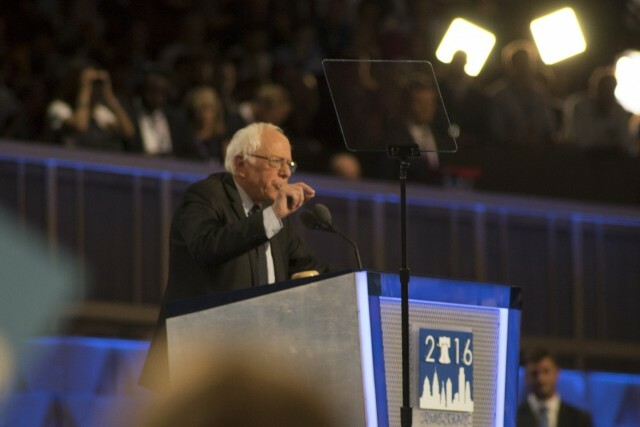 During Tuesday’s roll-call vote for the Democratic nominee, Sen. Sanders left many of his most ardent delegates stunned as he motioned to suspend the rules of the convention and nominate Clinton immediately. Some Clinton supporters inside the arena wept as the party now appears more divided than the Republicans. The spurned delegates then exited Wells Fargo Center and occupied the media pavilions right outside the convention, where they continued to protest Clinton’s nomination. Rows of police officers observed the peaceful protest as it carried on throughout the night. The half-empty arena then awaited for its key note speaker President Bill Clinton, who delivered a powerful speech, calling Hillary his best friend and the real change maker. Clinton rarely talked about his eight years in office where he helped spur an economy and created 21 million jobs, but also signed a crime bill that put many African-Americans in prison for years, which Hillary now says was a mistake. Philip Swanson is a sophomore at UMBC. Contact the author.